The total amount spent on fuels is calculated by multiplying the total energy use by building components (which is disaggregated by fuel) by the fuel cost per unit energy (for each fuel). A similar calculation is performed to find the BAU equivalent. The amount of this total that consists of taxes is determined by multiplying the quantity of energy used by the amount of fuel tax per unit energy. Taking the difference between the policy and BAU values for taxes paid gives the change in fuel taxes paid in the buildings sector. Taking the difference between the total amount spent on fuels in the BAU and policy cases gives the change in total amount spent on fuels. We subtract out the difference in taxes to obtain the change in payments to the fuel industry (this is disaggregated by fuel, so the “fuel industry” impacts can be recategorized into more meaningful industry categories on the Cumulators page). 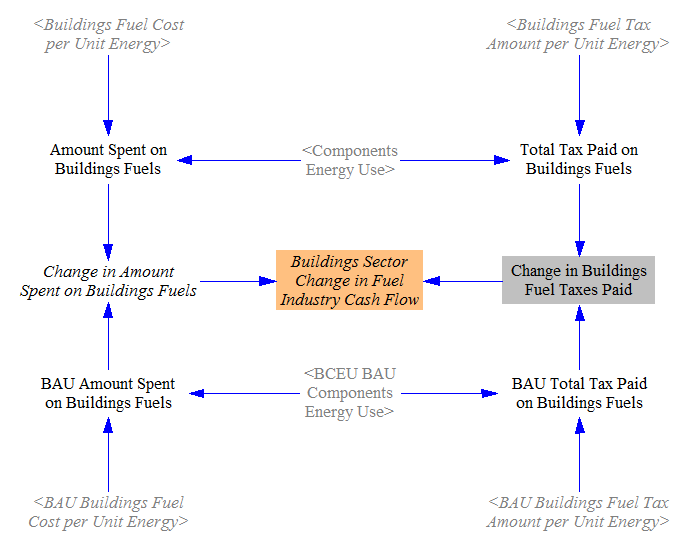 In calculating the effect of policies on building component costs, we only consider components of the types tracked in the Energy Policy Simulator (EPS): heating systems, cooling and ventilation, envelope, lighting, appliances, and other energy-using components. Certain policies, such as the carbon tax, may have a small effect on other components (say, cabinets or countertops) and on the cost of construction activities, but these impacts are not tracked by the model. The building component R&D policy can reduce capital costs by a user-specified percentage. 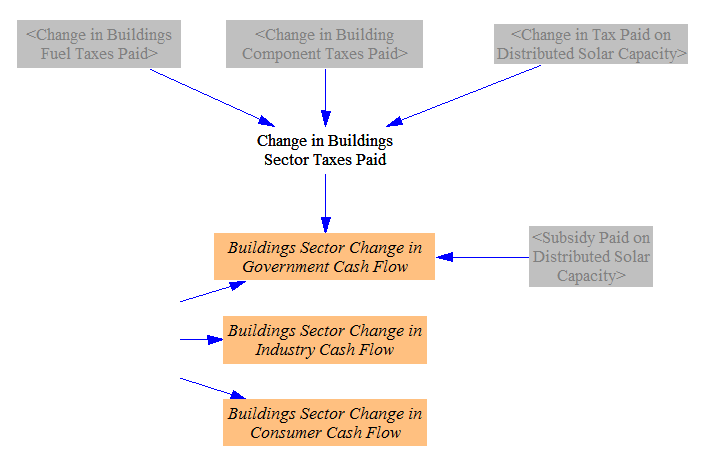 Various policies (described on the main Buildings Sector page) affect the efficiency of new building components. The percent change in energy use (for the same set of components) is combined with an elasticity of component price with respect to energy use to obtain a change in policy case component costs. The carbon tax can increase the cost of building components according to the amount of embedded carbon within those components (that is, emissions that occurred upstream in order to manufacture and transport the components, and whose costs may be passed on to purchasers). Distributed solar PV costs are handled via the endogenous learning curve for solar PV technology, which is discussed in the Electricity Sector. This means that their costs decline based on total solar PV deployment. 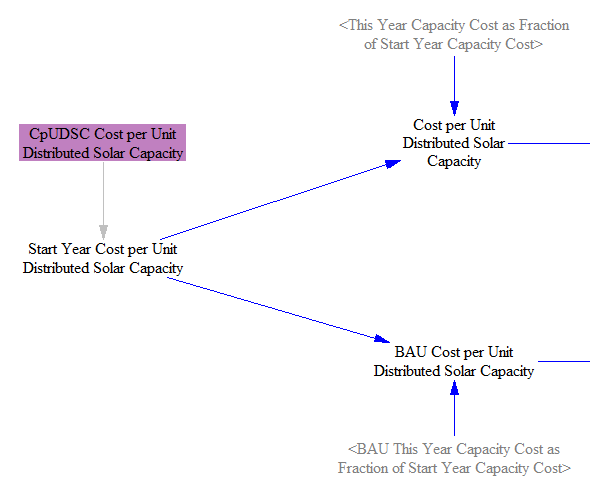 We begin with the cost of distributed solar per unit capacity in the start year of the model run and apply the result of the endogenous learning calculation to find the cost per unit capacity in the current year, for both BAU and policy cases. We multiply by the amount of distributed solar capacity added in the BAU case and in the policy case to find the total amount spent on distributed solar in the current year in each case. We then take the difference to find the change in amount spent on distributed solar due to policies. We multiply the amount spent by the tax rate to find the tax paid on distributed solar equipment in the BAU and policy cases, and we subtract these values to find the difference in taxes paid due to policy. We subtract the difference in taxes paid from the difference in total amount paid to find the change in cash flow for distributed solar equipment suppliers. 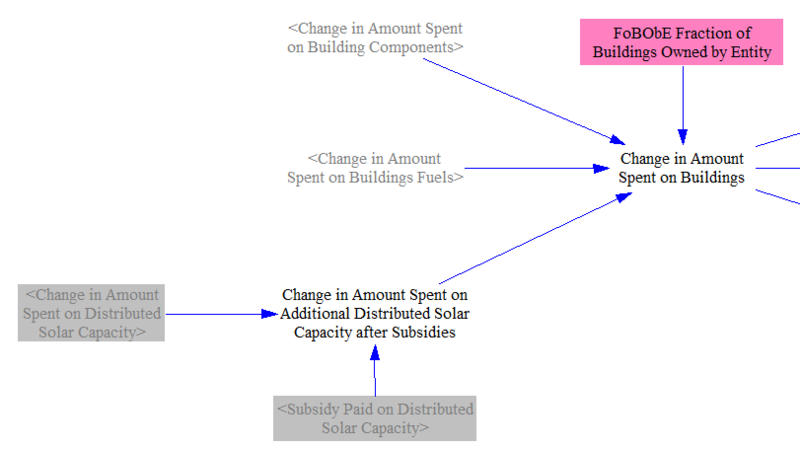 Separately, we calculate the amount spent on the subsidy for distributed solar equipment when that policy is enabled. 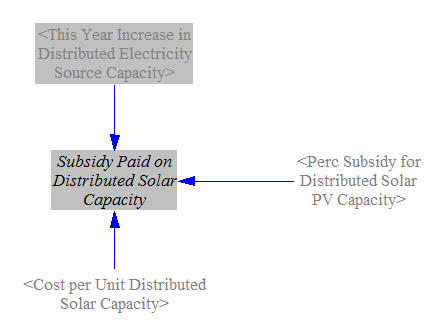 We multiply the increase in distributed solar capacity this year (not just the increase caused by the subsidy policy, but the total increase, as the subsidy is paid for all new distributed solar PV) by the cost per unit capacity and by the subsidy percentage to yield the total quantity of subsidy paid. We also sum up the change in capital equipment supplier cash flows, which comes from changes in amounts spent on building components and on distributed energy systems.